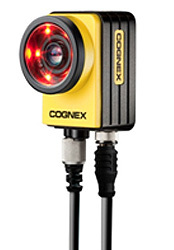 Cognex In-Sight® vision systems are unmatched in their ability to inspect, identify and guide parts. These self-contained, industrial grade In-Sight vision systems combine a library of advanced vision tools with high-speed image acquisition and processing. Best of all, configuring and deploying an In-Sight vision system has never been easier. Simple-to-follow EasyBuilder® configuration software helps users of all experience levels to quickly setup their entire In-Sight vision application—no programming or spreadsheet knowledge required. The VisionView® operator display panel provides a "plug-and-go" solution for monitoring the runtime operation of any In-Sight vision system on the network. Available in a wide range of models to meet any price and performance requirement, In-Sight Micro vision systems and In-Sight 5000 vision systems set the standard for automated inspection and product quality assurance across a wide range of industries. This powerful vision system performs fast, accurate inspections while its compact footprint easily ts into space-constrained production lines. With this vision system, the focus values associated with the inspection of specific parts can be saved in the system so that when a part change is loaded, autofocus functionality enables the lens to refocus for the new part. The In-Sight 8000 series ultra-compact, standalone vision systems deliver industry-leading vision tool performance at PC speeds, all in the micro form factor of a typical GigE Vision camera.